In my purse, I carry a small blue zip pouch that contains what I consider my everyday essentials: eye drops, concealer, lip balm, blotting papers, an Ouchless elastic or two, and last but not least, hand lotion. Hand lotion helps combat winter dryness and makes me feel better after I've washed my hands with harsh public washroom soap. However, finding an effective yet yummy-smelling travel-size lotion was always difficult for me--until now. Months ago, I cashed in a $10 gift certificate to a Robson Street cosmetics shop by picking up a bottle of OPI lacquer in a shimmery fuchsia. 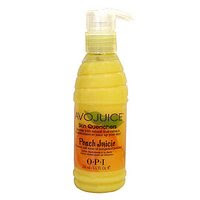 I needed something to top off my purchase total, and on a whim I threw in a 15 ml bottle of Avojuice Skin Quenchers Lotion in Peach Juicie. I've been using my little bottle of Avojuice for the past month and couldn't be more pleased with it. The first thing I noticed about the bottle was how compact it was compared to the mini bottles of Lubriderm that I was used to. Although both brands make their trial sizes in 15 ml bottles, the Avojuice bottle is a lot slimmer and just a tad taller, which means it takes up less room in my purse. The bottle is also easier to squeeze, letting me control exactly how much I want to use at a time. As for scent and texture, there was no contest: Avojuice has the most tantalizing peachy smell, and the lotion absorbed into my skin quickly and left my hands feeling silky smooth. It left Lubriderm in the dust on both counts. For only $2 a pop, I'm definitely stopping by this store to pick up another bottle when my first one runs out. Maybe I'll try a different scent the second time around. Good stuff! So cheap too, which store did you buy it in? I'd say my handbag essentials are lip balm, blotting papers, some bobby pins and a couple hair elastics. yes, ive added you to my blogroll! Something that's better than Lubriderm? Wow! LOL there are probably loads of lotions better than Lubriderm; I just got caught in a rut of buying and toting trial-size bottles of it instead of looking for trial-size bottles of something else. I have to say though, in terms of getting the job done, Lubriderm is a pretty reliable staple. Hmm that reminds me I'm out of lotion. I really should pack some for work. The air conditioning and hand washing really dries outmy hands. Unfortunately, though I love them, scented lotions make me sneeze! I'm still looking for good non-scented lotion if you know of some. I've never heard of that brand...I wonder if we have it in the states. PS: We've awarded you an E for Excellence blog award! MizzJ, I bought it at Shifeon. I can't remember the street address, but if you walk along Robson you'll see it. Geri, thanks for adding me to your blogroll! Tea, the only non-scented lotion I've tried and really liked is Cetaphil. It absorbs quickly and is non-greasy, and unlike other non-scented lotions I've tried, has no weird medicine-y odour. Asian Cajuns, Avojuice is made by the same people who make OPI nail lacquers. I've seen it sold in some beauty supply stores and in nail salons. Thanks for the award btw! I love OPI lotion, i have the cranberry one!! sooo yummy..